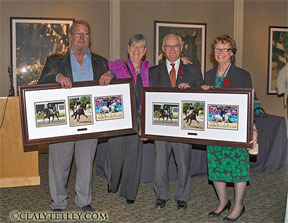 Dressage Canada is pleased to announce that Mary and Eric Brooks of Cedar Valley, ON, and Anne and John Welch of King City, ON, have been named as the 2012 Dressage Canada Owners of the Year. The Brooks and Welch families co-own Brookhaven Dressage Inc’s D Niro (D Day by Alitalia), a 13-year-old Swedish Warmblood gelding that represented Canada at the 2012 Olympic Games with Jacqueline Brooks of Cedar Valley, ON. Jacqueline found D Niro in March 2011 and has already recorded a very impressive string of top 10 finishes in international Grand Prix competition. In 2012 alone, Jacqueline and the talented D Niro, were second in the Grand Prix Special at the WCD Spring Challenge and at CDI 3* Lexington. The pair also placed second in both the Grand Prix and Grand Prix Special at CDI 3* Burlington in May. They cemented their spot on the Canadian Team with victories in Grand Prix and Grand Prix Special Tests at the last qualifying event, the CDI 3* at Blainville. Following the Olympics, Jacqueline and D Niro debuted their new Grand Prix Freestyle to rave reviews and the top score of the evening at the prestigious Dressage at Devon CDI-W.
“Our ownership of Jacqueline’s horses has, and continues to be, quite a ride. It has taken us to a Pan Am Games, a WEG, a World Cup and two Olympics. We are very content and feel privileged to continue to share in Jacquie’s ongoing international competitive achievements. With each new horse that comes into our lives, we, share the dream that the best is yet to be. We are pleased to be named Dressage Canada Owners of the Year and thank Dressage Canada for acknowledging our 20 year participation in this beautiful sport,” added Mary Brooks. Mary and Eric Brooks and Anne and John Welch were recognized at the Dressage Canada 2012 Celebration of Dressage held November 8th at The Royal Agricultural Winter Fair in Toronto, ON. Past winners of the Dressage Canada Owner of the Year Award include Karen Soupcoff (2003), Deryol Andrews (2004), Evi Strasser (2005), Doug Leatherdale (2006), Faith Berghuis (2007), Ian and Moreen Nicoll (2008), Robyn Eames (2009), Cindy Ishoy (2010), and Christine and Augustin Walch of W. Charlot Farms.